The youngest of four children, Elizabeth Spencer was born Elizabeth Dickerson on April 12, 1871; her father died eight months later. In 1874, her mother remarried to Col. William Gilpin, who had served as the first governor of the Territory of Colorado in 1861. The family moved to Denver, where Spencer received vocal training and learned to sing, recite stories and poetry, and play piano and violin. She graduated from St. Mary’s Academy and, after going on an extensive European tour, married Otis Spencer, an attorney. 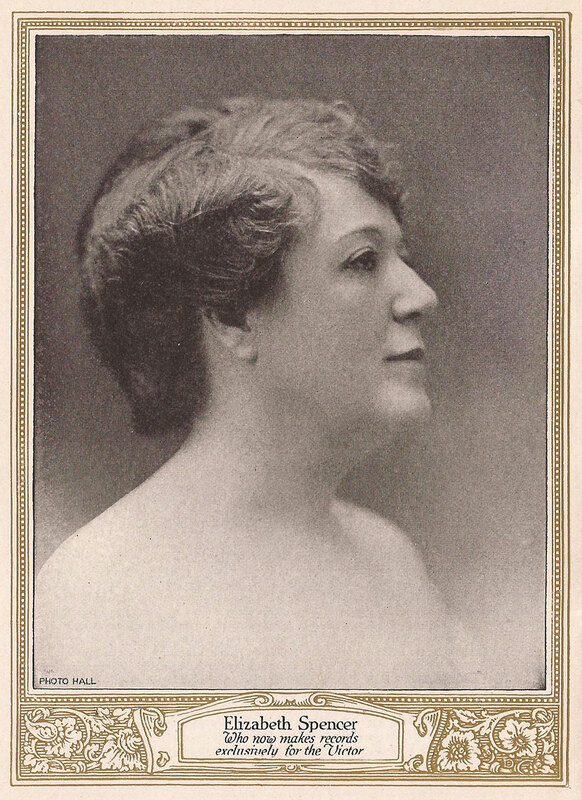 A recognized society woman, Spencer sang in churches, concerts, clubs, parties and amateur theatricals. She got her big break in 1905, performing a successful solo act at the local Orpheum Theatre, her professional debut in a major vaudeville house. Her second engagement, a one-act sketch, displayed her acting abilities, and the experience led to roles in Broadway road companies. By 1910, she was residing in New York City and making her first recordings in an era dominated by a formal, opera-influenced style of singing. Signing an exclusive contract with inventor and businessman Thomas Edison’s staff, she became its most prolific vocalist in the studio, participating in solos, duets, trios, quartets and choruses. Edison loved Spencer’s rich, high-quality voice—she was often billed as a “dramatic soprano”—and he would frequently study its vibrations and quality. Having made only phonograph cylinders, Edison decided to add a disc format to the product line because of increasing competition from rivals such the Victor Talking Machine Company. His “Diamond Discs” enjoyed commercial success from the mid 1910s to the early 1920s. Spencer’s first Diamond Discs were distributed as samples to dealers to demonstrate on phonographs. The Diamond Disc was where the majority of her best work was heard, her singing quality reproduced with greater accuracy. The public “Tone Test” demonstrations would prove to be Edison’s greatest promotional scheme. He chose Spencer to travel around the country and fill theaters and auditoriums, greeted by dealers, salespeople and thousands of Edison phonograph owners. She would sing at the same level with the phonograph. The venue would darken, and the audience members had to guess when the artist stopped singing and when the phonograph took over, revealing the superior qualities of Edison’s sound reproduction. The Edison studio cashbooks document Spencer in approximately 661 sessions by the time her Edison commitment expired in 1916, more than any other vocalist. She signed with the Victor Talking Machine Company, but her output there paled in comparison to that at Edison. She returned to Edison in 1920, though her recording sessions slowed down considerably. When radio broadcasting began in the 1920s, she sang and recited “on the air.” Despite the greater audio fidelity of Diamond Discs, they were more expensive than and incompatible with other brands of records, ultimately failing in the marketplace; Edison closed the record division a day before the 1929 stock market crash. Spencer died in Montclair, New Jersey in 1930, ten days after her 59th birthday.